The purpose of this lab was to determine the effect of changes in the pH and the partial pressure of oxygen on haemoglobin’s affinity for oxygen and percent oxygen saturation in the Bos taurus blood. At a lower pH (6.8) with a 21mmHg p50 value, it was found that the oxygen dissociation curve shifted to the right, which indicates that the Bohr Effect causes haemoglobin to lose its affinity for oxygen. This concludes that the increased carbon dioxide concentration forces haemoglobin to release its bound oxygen to the high metabolizing tissues (converting to deoxy-haemoglobin), but also forces the protein to bind more oxygen at the respiratory surfaces in order to transport enough oxygen to areas with a low oxygen partial pressure. At a higher pH (7.4), the oxygen dissociation curve shifted to the left with a 14mmHg p50 value since haemoglobin receives more oxygen, causing haemoglobin to have a higher affinity for oxygen and to remain as oxyhaemoglobin. Both sigmoid shaped curves contain a steep portion at 9.1mmHg and a plateau at 60mmHg. In conclusion, since the p50 value at pH 6.8 (21mmHg) is lower than the p50 value at pH 7.4 (14mmHg), this signifies that in an acidic environment, there is a higher partial pressure of oxygen in the environment as haemoglobin cannot bind the available oxygen as much due to its lowered affinity for oxygen. Haemoglobin is a specialized protein found inside the red blood cells of vertebrates that have developed organs for gaseous exchange as a substitute for simple diffusion. This respiratory pigment transports dissolved oxygen in the blood from the respiratory surface to the tissues through the circulatory system, and transports carbon dioxide back for excretion at the respiratory surface by exhalation. When one oxygen molecule binds to the iron containing heme group of the tetrameric-structured haemoglobin—which has four globulin subunits non-covalently linked to each other: two alpha- and two beta-polypeptide chains—its allosteric property increases its affinity for the addition of the next three successive oxygen molecules (Fenton et al., 2015). A total of four oxygen molecules can bind to this protein; however changes in the partial pressure of oxygen at the gas exchange site can affect haemoglobin’s percent oxygen saturation and changes in pH can alter haemoglobin’s affinity for oxygen (also known as the Bohr Effect). The magnitude of the Bohr Effect in haemoglobin results from the breaking of the salt bridges between the histidine residues when the protein changes between its two structures at equilibrium: oxyhaemoglobin and deoxyhaemoglobin (Kilmartin, 1974; Zheng et al., 2013). During the structural shift, the histidine residues will react with the sulfhydryl group of the cysteine that is found in the deoxyhaemoglobin (Okonjo et al., 2014). Consequently, this change in the structural conformation of cysteine leads to a reduced Bohr Effect (Okonjo et al., 2014). Since deoxyhaemoglobin has been altered at a chemical level, it will experience a minimized Bohr Effect while its affinity for oxygen increases (Riggs, 1988). The Bohr Effect states that in a high pH alkaline environment, protons are released when oxygen is attached to haemoglobin; but are not released when in an acidic environment (Riggs, 1988). To what extent did the variations of PO2 and pH levels affect haemoglobin’s percent oxygen saturation in the Bos taurus blood was examined as the main purpose in this lab and is depicted by an oxygen dissociation curve. The resultant sigmoidal (S) shape relates the partial pressure of oxygen and haemoglobin’s percent oxygen saturation at different pH levels. Given that the manometer PO2 is held constant at the specific mmHg value, it is predicted that the oxygen dissociation curve will shift to the right at a pH of 6.8 (which is lower than the normal pH value of 7.4) as there is an increase in carbon dioxide concentration. This indicates that a pH drop will decrease the percent oxygen saturation of haemoglobin, and hence, its affinity for oxygen. Conversely, it is estimated that the curve will shift to the left at a pH of 7.4 as there are less carbon dioxide molecules in an alkaline environment. It is also predicted that at P50, there will be a difference in the percent oxygen saturation of haemoglobin at the different pH levels and that the two sigmoidal curves of the oxygen dissociation graph will eventually meet at equilibrium past P50 due to the Bohr Effect. In relation, Hill conducted his experiment with a similar procedure on human muscle and haemoglobin and concluded that at a higher pH level (muscle haemoglobin at pH 9.2 and blood haemoglobin at pH 9.2), the curve shifted to the left while at a lower pH level (muscle haemoglobin at pH 7.0 and blood haemoglobin at pH 7.0), the curve shifted to the right due to the Bohr Effect (Hill, 1936). This experiment was conducted based on the BIO202 lab manual; however, the procedures performed for the Bos taurus at pH 7.4 under section 2 was deviated from the instructions provided. The maximum vacuum pressure was set at 750 mmHg instead of the listed value of 700mmHg since vacuum did not provide enough pressure at 700mmHg to deoxygenate the blood appropriately. My lab partners, Isabel, Zainab and Dianne, performed the experimental tests on Bos taurus buffered at pH 7.4. We collected the data conducted at pH 6.8 from our colleagues: Kashamala, Kiran, Jing, and Seevin. This oxygen dissociation curve graph depicts a logarithmic regression that relates the effect of the partial pressure of oxygen on haemoglobin’s percent oxygen saturation at both pH levels in Bos taurus. The manometer reading was converted to the partial pressure of oxygen with equation a listed in the appendix. In addition, the percentage transmittance value obtained from the spectrophotometer was converted to the percent oxygen saturation of haemoglobin using the equations of the two logarithmic regression curves. The P50 value at pH 6.8 is ~21mmHg and at pH 7.4 is ~14mmHg. This value reveals the change in the partial pressure of oxygen at the different pH levels due to the Bohr Effect when 50% of haemoglobin has been saturated. 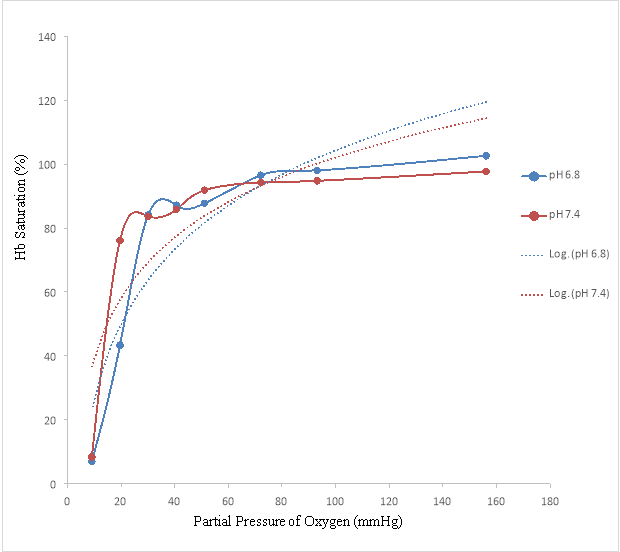 In Figure 1, the effect of the partial pressure of oxygen on the percent oxygen saturation of haemoglobin illustrates a sigmoidal shape as the main trend at the pH of 6.8 and 7.4. As PO2 increases, haemoglobin’s oxygen saturation also increases until a maximum amount of oxygen molecules have bound to this blood pigment. There are two patterns in this oxygen dissociation graph: (1) the steep (beginning at 9.1mmHg) and (2) the plateau (~60mmHg). The steep section begins when PO2 first rises from 9.1mmHg and the percent saturation increases drastically. At pH 6.8, the steepness levels off at point three where PO2 is 30.1mmHg and the percent saturation is at 84.0826%. At pH 7.4, the steepness levels off at point two where PO2 is 30.1mmHg and the saturation is at 83.6601%. When haemoglobin has reached its maximum oxygen capacity, the curve relating PO2 and haemoglobin saturation plateaus and become theoretical. During this period, haemoglobin maintains its maximum oxygen saturation at the maximum PO2. At pH 6.8, the maximum PO2 of 156.12mmHg occurs when the vacuum is not used (the pressure remains at 0mmHg), which gives haemoglobin a maximum theoretical oxygen saturation of 102.612%. At pH 7.4, the maximum PO2 of 156.12mmHg gives haemoglobin a maximum oxygen saturation of 97.7172%, which is slightly lower than the value at pH 6.8. In terms of pH change (the Bohr Effect), the curve of the lower pH shifts to the right while the curve of the higher pH shifts to the left. However, the starting point for both of the sigmoidal-shaped curves is at PO2 of 9.1mmHg, where 6.9259% saturation is for pH 6.8 and 8.3333% saturation is for pH 7.4. The results support the hypothesis that the oxygen dissociation curve will shift to the right at the pH value of 6.8, showing that haemoglobin’s (Hb’s) percent oxygen saturation decreases (due to a lower affinity for oxygen), whereas the graph will shift to the left at the pH value of 7.4, demonstrating that haemoglobin’s percent oxygen saturation increases (due to a higher affinity for oxygen). The p50 values from the graph indicates that in a basic environment, there is a lower partial pressure of oxygen in the environment (14mmHg) when compared to an acidic environment (21mmHg) because haemoglobin is able to bind to more of the available oxygen due to its increased affinity for oxygen whereas at pH 6.8, haemoglobin is unable to bind to as much oxygen due to its decreased affinity for oxygen. The reason behind this lowered oxygen affinity is due to the Bohr Effect and the high concentration of carbon dioxide present in the area. Moreover, the amount of carbon dioxide concentration present changes the pH, which directly affects the ability of haemoglobin to bind to oxygen and readily dissociate oxygen. When there is a high partial pressure of oxygen in an area where haemoglobin is present, the tetrameric protein’s percentage saturation of oxygen increases as well because there are more available oxygen molecules to bind to. Due to the cluster of oxygen molecules around this blood pigment, haemoglobin’s affinity for oxygen becomes tremendously improved due to its allosteric property, where the next three successive oxygen molecules are more readily bound after the first one has been attached. From this, since haemoglobin is able to transport more oxygen molecules from the respiratory surface, a high concentration of oxygen is released into the blood plasma to be absorbed by the surrounding tissues. This is why in Figure 1, the graph—comparing the effect of the partial pressure of oxygen on haemoglobin saturation—has an incredibly steep curve at the beginning to indicate that haemoglobin is able to pick up a lot of oxygen molecules. From the graph, at pH 6.8, there is a high partial pressure of carbon dioxide where water reacts with carbon dioxide, generating H+ ions that produce an acidic environment with a low pH (Riggs, 1988). This reduces haemoglobin’s affinity for oxygen, where haemoglobin subsequently converts into deoxyhaemoglobin, which is its alternate structural form. In this acidic environment, the tissues are at a high metabolic rate and need more oxygen molecules. So, according to the Bohr Effect, haemoglobin will bind to more oxygen at the respiratory surface and release its oxygen content more readily at the tissues (where there is a lowered PO2) in order to raise the pH level back to normal. In essence, the body raises the partial pressure of oxygen to match that of carbon dioxide so that a dynamic equilibrium is created to raise blood pH back to normal levels and reduce the acidity – where the rate of perfusion and ventilation is equal to each other. In terms of the pH at 7.4, there is low carbon dioxide partial pressure where the environment is more alkaline. The Bohr Effect prevents the transport of oxygen to the deoxygenated area, so that the partial pressure of oxygen also decreases in respect to the partial pressure of carbon dioxide in an attempt to decrease the pH level. However, if haemoglobin attaches onto oxygen, protons are released, which equals out the increase in oxygen with an increase in carbon dioxide. Thus, the increase in H+ is directly proportional to the increase in CO2 (Riggs, 1988). The two curves eventually meet together at one point, indicating that Bos taurus is attempting to maintain pH equilibrium, where pH 6.8 attempts to raise Hb saturation for a more alkaline environment and pH 7.4 attempts to reduce Hb saturation for a more acidic environment. However, the Bohr Effect presents an advantage to the body when it is subjected to an oxygen deficient environment during exercise, where there is lactic acid buildup, a drop in blood pH, and an increase in carbon dioxide and hydrogen concentrations. The formation of carbonic acid and H+ ions from the reaction between water and carbon dioxide produces an acidic environment, lowering the pH levels (Riggs, 1988). In these regions, the production of carbon dioxide from muscle cells inhibits haemoglobin’s affinity for oxygen in the bloodstream by binding to haemoglobin itself, forming carbamino haemoglobin. Carbamino haemoglobin brings the H+ protons generated along with the carbon dioxide molecules to the lungs, where it is expelled through exhalation (Riggs, 1988). When this happens, there is not enough oxygen present at the tissues, so the Bohr Effect sends haemoglobin to the tissues, which readily releases its oxygen content into the tissues because it can no longer hold onto the molecule as it travels further into the bloodstream. Eventually, the Bohr Effect helps to raise blood pH back up to normal levels when enduring anaerobic respiration since haemoglobin is continually releasing its bound oxygen molecules as its affinity decreases to be the rising carbon dioxide levels. It is beneficial for haemoglobin to have a low affinity for oxygen near the tissues to increase oxygen uptake by the tissues, but to have a high affinity for oxygen at respiratory surfaces so haemoglobin can transport as much oxygen as possible, and as far into the body as possible. Thus, altering the oxygen affinity of haemoglobin is the body’s way of using the Bohr Effect to its advantage to solve the problem of lacking oxygen since more oxygen is released with an increase in carbon dioxide levels. One limitation of the experiment involved the absence of a spectrophotometer and the instrumental error of the vacuum. The vacuum failed to serve its purpose at the 700mmHg level, so it had to be increased to the 750mmHg level for the procedure done for pH 7.4, which results in an unfair comparison for the data done for pH 6.8. In conclusion, when pH is low, haemoglobin has less affinity for oxygen (lower saturation) whereas when pH is high, haemoglobin has more affinity for oxygen (higher saturation). Fenton, B., Dumont, B., and Owen, M. (2015). Respiratory Pigments: Hemoglobin and Hemocyanin. In Integrative Animal Biology (ed. S. Hinic-Frlog), pp. 300-301. Toronto, ON: Nelson Education Ltd.
Hill, R. (1936). Oxygen Dissociation Curves of Muscle Haemoglobin. Proc. R. Soc. Lond. 120, 472-483. Kilmartin, J. V. (1974). THE ALKALINE BOHR EFFECT OF HUMAN HEMOGLOBIN.Annals of the New York Academy of Sciences. 241, 465-471. Okonjo, K. O., Olatunde, A. M., Fodeke, A. A. and Babalola, J. O. (2014). Bohr effect of human hemoglobin A: Magnitude of negative contributions determined by the equilibrium between two tertiary structures. Biophysical Chemistry. 190, 41-49. Riggs, A. F. (1988). The Bohr Effect. Annual Reviews Inc. 50, 181-204. Zheng, G., Schaefer, M. and Karpus, M. (2013). Hemoglobin Bohr Effects: Atomic Origin of the Histidine Residue Contributions. Biochemistry. 52, 8539-8555. This standard curve graph depicts a linear regression that relates the effect of percent transmittance on the percent saturation of haemoglobin at both pH levels in Bos taurus. Oxygenated haemolysate was exposed to the vacuum at a maximum pressure of 700mmHg for 5 minutes to become entirely deoxygenated, which was added to the oxygenated haemolysate. Different amounts of 100% oxygenated and 100% deoxygenated haemoglobin were combined to give five various saturation percentages. 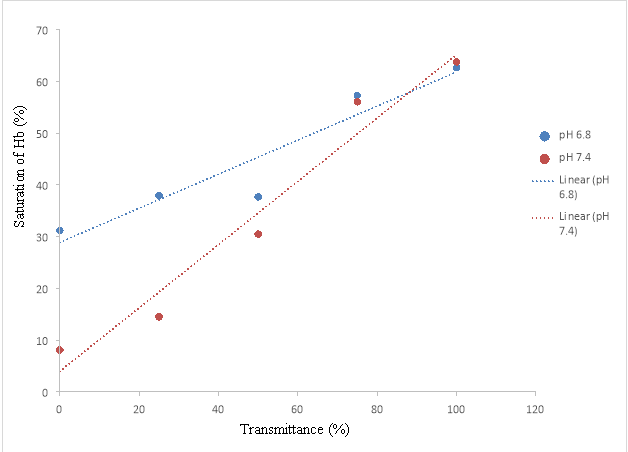 A percent transmittance reading was taken for each of the saturation percentages, using a spectrophotometer. (Equation a), where D is the barometric pressure (measured in mmHg), W is the water vapor pressure (measured in mmHg), and M is the manometer reading (measured in mmHg). The temperature was 22ºC and the barometric pressure was 763mmHg for the lab room. Therefore, the partial pressure of oxygen at a manometer reading of 300mmHg is 93.1mmHg. The regression line equation is used to convert the percent transmittance to the percent oxygen saturation of haemoglobin. The regression line equation is , where the variable y represents the percent transmittance value and the variable x represents the percent oxygen saturation of haemoglobin. Therefore, the percent oxygen saturation of haemoglobin is 98.0559% at the pH 6.8. Therefore, the percent oxygen saturation of haemoglobin is 94.7712% at the pH 7.4. "Effect of pH on Percent Oxygen Saturation of Haemaglobin." UKEssays.com. 11 2018. All Answers Ltd. 04 2019 <https://www.ukessays.com/essays/biology/measuring-the-effect-of-ph-on-oxygen-saturation.php?vref=1>. "Effect of pH on Percent Oxygen Saturation of Haemaglobin." All Answers Ltd. ukessays.com, November 2018. Web. 20 April 2019. <https://www.ukessays.com/essays/biology/measuring-the-effect-of-ph-on-oxygen-saturation.php?vref=1>. UKEssays. November 2018. Effect of pH on Percent Oxygen Saturation of Haemaglobin. [online]. Available from: https://www.ukessays.com/essays/biology/measuring-the-effect-of-ph-on-oxygen-saturation.php?vref=1 [Accessed 20 April 2019]. UKEssays. Effect of pH on Percent Oxygen Saturation of Haemaglobin [Internet]. November 2018. [Accessed 20 April 2019]; Available from: https://www.ukessays.com/essays/biology/measuring-the-effect-of-ph-on-oxygen-saturation.php?vref=1.